"NOT"....PINKS ALL OUT of the past, something Bigger & Better" Heads up ALL OUT style racing is coming to track near you. With multiple ET race classes there's more chances to compete and win prizes. The addition of our new show segment THE CALL OUT brings some of the top grudge matches to ALL OUT Live events. Spectators play along as well with our new "Instant Green" game show. That's right everyone has a chance to join in on the action at an ALL OUT Live event. All events will be broadcast via Live Stream and recorded for television on MAV TV and REVN TV. 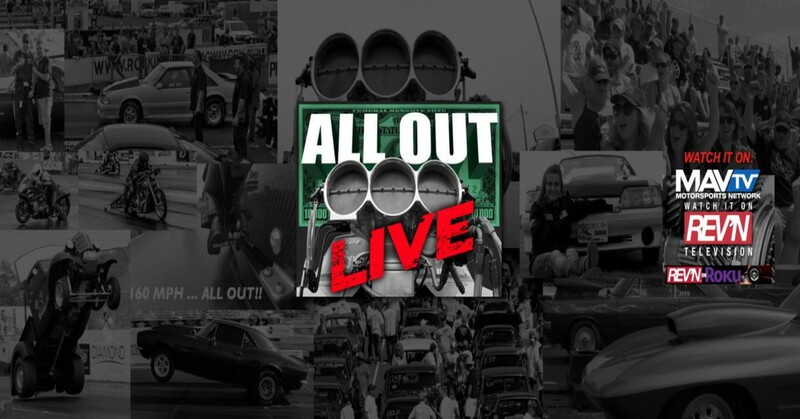 THE WORLDS FIRST LIVE & TELEVISED DRAG RACING GAME SHOW- "ALL OUT LIVE"
If you liked PINKS ALL OUT then your going to love ALL OUT Live. Three shows....One Location, everyone in attendance gets a chance to win Big Cash & Prizes! ALL OUT Racing: With three heads up ALL OUT style ET race classes (Street, Muscle & Extreme) there's more chances for racers to compete and Win Big Cash & Prizes! The CALL OUT: From Keyboard to Concrete, Top Outlaw & Grudge racers from all over the country take on local area racers who think they can beat them.. It's a CALL OUT! Got a beef with another racer or shop? Settle it on our show, check out the CALL OUT section of this site for details! INSTANT GREEN: A fan interactive game show held at every ALL OUT Live. event. Fans from the stands and viewers online can play along with Instant Green host "Gavin Jerome" for Cash & Prizes! All Out Live entertainment and Boss One Media llc® along with our host tracks and sponsors have no affiliation with MavTv®, RevnTV®, Roku®, Fox Television®, All logos and registered trademarks are property of their registered owners.